The Coheed and Cambria saga, which has expanded beyond albums into books and comics, centers on an interlocking series of planets known as “The Keywork” and characters hoping to prevent (or bring about) its destruction. The band’s name comes from two characters who die pretty early on, but the universe goes on without them, and the story comes to focus on their son, whose name is also Claudio. While most rock bands write about unrequited love, break-ups, and cars, Coheed writes about those things set against a backdrop of intergalactic intrigue, messianic superheroes, and meta-twists involving talking bicycles. Years before the mainstream wholeheartedly embraced things like the Marvel cinematic universe or Game of Thrones’ labyrinthine narrative, Coheed turned their seemingly oddball saga into a massive success, built on both casual fans of songs like their 2003 emo banger “A Favor House Atlantic” or the 2005 metal anthem “Welcome Home” as well as the cult-like following that could tell you each album’s entire story front to back—if you’ve got a few hours to spare, anyway. For the most part, Sanchez is the universe’s engineer. He was inspired to write the initial story during a trip to Paris he took in the early aughts. It began both on Coheed’s first album Second Stage Turbine Blade and a comic series called The Bag On Line Adventures. Always a bit awkward and self-conscious, Sanchez said he felt more comfortable wrapping up his personal trials and tribulations in a winding mythology. Over the years, he’s spoken at length about how comics ranging from Batman to weird stuff by Alejandro Jodorowsky and movies ranging from Star Wars to weird stuff by Alejandro Jodorowsky have influenced his writing. But, he told Kotaku, his bread and butter isn’t just books, movies, and comics. He’s been playing games his whole life, too, and just like everything else he surrounds himself with, those influences have a way of seeping into his stories. Sanchez first started playing games on an Atari 5200 he bought with his brother when they were kids. They just wanted a video game system—any video game system—so they took the first thing they could get. Then a friend from school got the more sophisticated Nintendo Entertainment System, and Sanchez and his brother were instantly filled with regret. “We were like, ‘Man, did we make a bad move,’” he said, laughing. Back in 2013, Coheed and Cambria collaborated with a studio called Man Vs. Games to create an Amory Wars mobile game called Fall Of The Keywork. It was a fighting game in which you could play as characters from Sanchez’s universe, which was cool, but it was also a fighting game. On mobile. You can probably do the math here. It was not well-received. He said, however, that he’d like to take another crack at making a video game someday. A first-person shooter, third-person action game, or a role-playing game are all possibilities. His most left-field idea, though, is a beat-‘em-up inspired by Double Dragon—one of his favorite games of all time—that would be released on an actual 16-bit cartridge. “I would love to do that,” he said. On the upcoming album, Vaxis—Act I: The Unheavenly Creatures, chiptune-style sounds form the pulsing synth dance floor beneath the sturdy metal footing of the title track. “Unheavenly Creatures” is a song in which one of the album’s main characters, Creature, recounts the crime-gone-wrong that landed him and his partner in a giant space prison called The Dark Sentencer. Sanchez is a father now, and he plays games with his four-year-old son, Atlas, primarily on the Nintendo Switch. For a while, he wouldn’t play games much on the road because other members of Coheed aren’t as into them, and because he didn’t want to monopolize the tour bus TV. In that respect, the Switch has been a godsend, he said. He and Atlas worked together to beat Mario Odyssey during a tour, and now they’ve moved onto Octopath Traveler. The other band members never ended up joining the game, but it’s been a useful exercise for Sanchez and his wife Chondra, who is also a writer and frequently collaborates with her husband. Sanchez said that he and Chondra are very comfortable as a creative team, but that can lead to formulas and patterns, which DnD allows them to break free of through improvisation. With a new, story-heavy album just around the corner, Sanchez is excited to bring the Amory Wars back to the forefront after a brief detour from it in the 2015 album The Color Before The Sun. 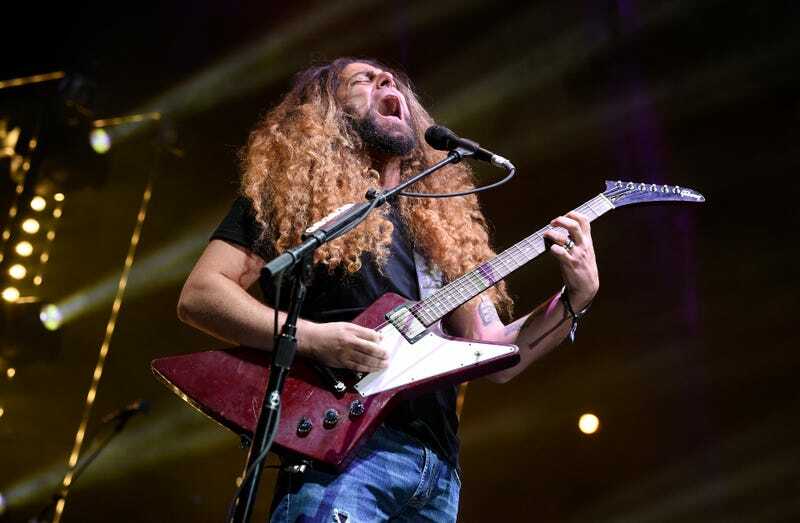 While the story might have some over-the-top trappings, it is deeply personal for Sanchez, who recently told Rolling Stone that he considered leaving the band prior to creating Unheavenly Creatures, only to realize that the Coheed saga is “in my blood.” For Sanchez, that moment was a reckoning. In traveling the world and telling this gargantuan, geeky, comic-and-game-inspired story, he gets to be a big kid forever. Now that he has a family, though, is that really what’s best for them? Growing up, he said, his own dad worked all day and came home exhausted. By contrast, Sanchez gets to spend time with his family all day long when he’s not on tour, and he gets to write songs and stories inspired by his favorite things and people for a living.